At a difficult time when thousands of people are evacuating Georgia for Armenia, one person is doing the exact opposite. Yerevan-based British photojournalist and fellow blogger Onnik Krikorian is in Georgia covering the conflict with Russia. Writing about a joint press conference with U.S. Secretary of State Condoleezza and Georgian president Mikhail Saakashvili, Onnik reports an incident that conventional media rather leave unmentioned. But, I also have to say, I was not impressed and wondered what the U.S. Secretary of State thought of sharing center stage with a man who likened the Russian invasion of Georgia with a girl being raped because she wore a short skirt. Such statements during the press conference did not appear sufficiently presidential, in my opinion, and were seemingly not reported by the mainstream media. Onnik’s photos are available here. Timid and emotional, Georgia’s Mikhail Saakashvili is no longer the confident democratic president the South Caucasus leader was a few weeks ago. Underestimating the right of might, his wish to win back breakaway South Ossetia has become a nightmare in his ex-Soviet country. In an ironic way, Saakashvili might have strengthened Russia instead. “When the president ordered to attack Tskhinvali [the capital of South Ossetia], we knew then we were doomed,” told a Georgian woman to Newsweek. “How come he didn’t realize that?” Saakashvili might have recognized the hardships that Ossetian and Georgian families were going to face in the face of the military action, but he either didn’t realize Russia’s role in Eurasia or hoped for American military build up in his country. Understandably, Saakashvili is popular in Georgia right now. During wars, people tend to support their leader, especially when the enemy is someone considered long-rooted colonizer. But the war, despite the de jure cease fire, is not going to help Georgia in the short run. Perhaps Saakashvili thought it might help Georgia in the long run. Here are some convictions that might have had a role in the Georgian president’s decision. Assumption 1. Saakashvili takes his democratically-elected (while forgetting his not-so-democratic crackdown on the opposition) status a privilege. To some extent it is true, but right is not always might in the realpolitik – especially when you are the president of an entire country. Assumption 2. Saakashvili thinks his western education and pro-western attitude is an extraordinary asset. Having a degree from Columbia doesn’t change the world imperial order. Assumption 3. States’ protection of “territorial integrity” is the West’s (especially the United States’) most-adored principle. Even in not-so-U.S.-friendly countries, like Bolivia, the State Department most of the time defends “territorial integrity.” (“[W]hy on earth should arbitrary lines drawn up by Stalin be the basis for statehood in the 21st century?” would respond Ossetians). Having the above convictions, these are two scenarios that might have crossed Saakashvili’s mind. Scenario 1. U.S. Military build up in Georgia would follow a Russian action after provoking the latter to attack Ossetia. This would be a perfect opportunity to invite NATO and U.S. soldiers to Georgia (forgetting that the U.S. has already has a front with Russia with the NATO bases in eastern Turkey). The bases could be used in a possible strike against Iran (especially if Saakashvili’s old friend John McCain becomes the president, and especially if Azerbaijan continues being an authoritarian country, and, thus, proving to be an unsuitable U.S. ally). Scenario 2. Given the history of Ajaria (another breakaway region that Saakashvili was able to reunite with Georgia without a single bullet), Georgia’s respect in the West (Bush visited Tbilisi a few years back) for its democratic image, and Georgia’s possible prospects to become more energy-independent from Russia due to the Baku-Tbilisi-Ceyhan pipeline, Saakashvili might have thought Russia would either ignore the attack on South Ossetia or would try to negotiate with Georgia. Neither the above nor any other scenario would have been beneficial for Georgia. The attack on South Ossetia was a perfect opportunity for Russia to showcase its power and new role in the region and in the world. Few political analysts would have expected inaction from Russia. So Saakashvili must have expected counterattack as well, but he either overestimated his abilities or underestimated Russia’s capable aspirations. Or he had a long-term vision of Iranian invasion. In either case, neither thought makes him a good leader for his people. Speaking of the people, the latter were the last thing that either Saakashvili or Russia cared about. Some time back Saakashvili skillfully fought racism in his country by saying, “For those in Georgia who hate Armenians, I will be an Armenian; for those who hate Azeris, I will be an Azeri. People have said I am Ossetian. I will gladly be an Ossetian. I will be a Jew as well, and this will be a great honor for me.” One wouldn’t t attack South Ossetia out of love for Ossetians, would they? Russia’s rhetoric was even more ironic. Claiming that it was defending its citizens, Russia came to “protect” a people who are generally treated as second-class citizens, to say the least, in Moscow. Like the rest of the people from the South Caucasus, Ossetians are part of the Russia’s “blacks,” people without blond hair who are often killed on the streets for simply not looking ethnic Russians. While it is not hard to understand racism among bitter and uneducated youth, Russian government’s inaction to prevent or even fully prosecute hate crimes in Moscow and other cities is inexcusable. Double-standards and hypocrisy is no news in politics. But even if Scenario 1 works and the U.S. moves in, Georgia’s people and their neighbors are not going to win in the long run. Small states working for a superpower don’t win. They need to work with superpowers, all of them. That’s one lesson Saakashvili didn’t learn at Columbia. August 9 is the United Nation’s International Day of the World’s Indigenous Peoples, yet many people don’t know what “indigenous peoples” means. Ironically, the ongoing war in South Ossetia is of interest in indigenous studies. I am currently editing an article that talks about Armenians and indigenous peoples. While Armenians, in general, have been considered “indigenous,” given that almost every nation in the Middle East and the Caucasus considers themselves native to their lands, the question of indigenous can be very controversial. Asst. U.S. Secretary of State Daniel Fried has testified in front of the House Foreign Relations Committee on the South Caucasus countries. Georgia has made a choice to join NATO. The United States and the nations of NATO welcome this choice, and Georgia’s neighbors should respect it. Azerbaijan has chosen to develop its relations with NATO at a slower pace, and we respect its choice. Armenia’s situation is different, due to its history and currently complicated relations with Azerbaijan and Turkey, and we respect its choice as well. Speaking about Azerbaijan, Fried said that “Azerbaijan has had the world’s fastest growing economy for three consecutive years.” Talking about Nagorno-Karabakh, he said “While we support Azerbaijan’s territorial integrity, Nagorno-Karabakh’s final status must be determined through negotiations and a spirit of compromise that respects international legal and political principles.” By “legal [principle] Fried means “territorial integrity,” by “political principles” he means “self-determination.” In other words, he hopes there is a golden mean to the conflict of the two. Fried finished the presentation on Azerbaijan by referencing the recent anti-Armenian rhetoric. “We hope that the Azerbaijani government will avoid the temptation of thinking that renewed fighting is a viable option. In our view, it is not. We have noted our concern with persistent bellicose rhetoric by some Azerbaijani officials.” Mr. 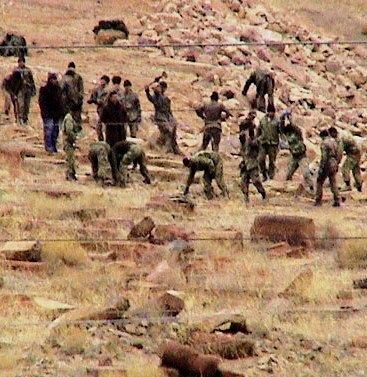 Friend, again and again, failed to mention the 2005 destruction of the Djulfa cemetery by Azerbaijan. I will send him an e-mail shortly. Talking about Armenia, Fried referenced the genocide by saying that Turkey needs to recognize it while Armenia needs to guarantee that it will not territorial claims against Turkey (ironically, official Armenia has always done the latter. Reconciliation between Armenia and Turkey, however, will require dealing with sensitive, painful issues. Turkey needs to come to terms with a dark chapter in its history: the mass killings and forced exile of up to 1.5 million Armenians at the end of the Ottoman Empire. That will not be easy, just as it has not been easy for the United States to come to terms with dark periods of our own past. For its part, Armenia must be ready to acknowledge the existing border and disavow any claim on the territory of modern Turkey, and respond constructively to any efforts Turkey may make. When peaceful mass protests followed the disputed vote, the United States and others pressed continuously for the government of Armenia to refrain from responding with force. However, on March 1, within hours of formal assurances by the Armenian government that they would avoid a confrontation, police entered the square. Ensuing clashes later in the day between demonstrators and security personnel led to at least 10 deaths and hundreds of injuries. Mr. Ter-Petrossian was taken to his residence by security forces, where he appeared to remain under de facto house arrest for weeks. A State of Emergency (SOE) was declared in Yerevan. Freedom of assembly and basic media freedoms were revoked. Opposition newspapers were forced to stop publishing and news websites were blocked, including Radio Liberty. The government then filled the information void with articles and broadcasts disseminating the government version of events and attacking the opposition. While it was alleged that some protesters were armed before the March 1 crackdown, there have been no convictions to date on such charges. Ironically, Fried finished his remarks on Armenia by connecting the recent unrest (and the need to resolve it) to the absence of a US ambassador to Armenia (the Democratic-controlled U.S. senate has refused to appoint an Ambassador who refuses to refer to the Armenian Genocide as such). Moscow has in recent years put economic and political pressure on Georgia: closing their common border; suspending air and ground transport links; and imposing embargoes against exports of Georgian wine, mineral water, and agricultural goods. This year, despite recently lifting some of the economic and transport embargoes, Moscow has intensified political pressure by taking a number of concrete steps toward a de facto official relationship with Abkhazia and South Ossetia, where Russian peacekeeping forces have been deployed since the early 1990s – up to 3,000 in Abkhazia, and 500 Russians plus 500 North Ossetians in South Ossetia. In March, Russia announced its unilateral withdrawal from Commonwealth of Independent States (CIS) sanctions on Abkhazia, which would allow Russia potentially to provide direct military assistance (though the Russian government has offered assurances that it will continue to adhere to military sanctions). On April 16, then-President Putin issued instructions calling for closer ties between Russian ministries and their Abkhaz and South Ossetian counterparts. Russian investors are known to be buying property in Abkhazia in disregard of Georgian law. Some of these properties may have belonged to displaced persons, making their eventual return even more difficult. Russian banks maintain correspondent relationships with unlicensed and virtually unregulated Abkhaz banks, an open invitation to money launderers. Interestingly, if you take Fried’s words for real there is no discrimination against minorities in Georgia, Azerbaijan and Armenia. While the U.S. State Department official repeatedly refers to “separatists,” there are no talk about discrimination against minorities and destruction of minority culture in either of the South Caucasus republics. The report also lacks mentioning human trafficking, which is very prevalent in Armenia and Azerbaijan. Fighting and preventing human trafficking is a major step of building democracy. The Q&A transcript hasn’t been posted as of June 18, 2008. The Uncyclopedia.org joke that “no one knows anything about Azerbaijan other than that they love their minorities, especially the Azerbaijanis” has become quite ironic. While the satirical reference has meant to ridicule Azerbaijan’s official motto that the South Caucasus republic is a “heaven of tolerance for minorities,” disturbing news from Radio Free Europe gives examples of non-discriminatory human rights violations in Azerbaijan. A series of abuses — some of them bizarre — have been documented in media reports. According to the reports, local authorities have ordered state employees to perform manual labor on weekends as a condition for keeping their jobs. People who fail to pay utility bills have been seized and tied to trees outside police precincts until a family member or friend can come and settle the debt. Residents are forbidden from hanging laundry from their balconies and from baking bread at home. In a region where average salaries are approximately $130 per month, farmers are charged a steep tax for owning more than one cow or one sheep — $25 per cow, $10 per sheep. 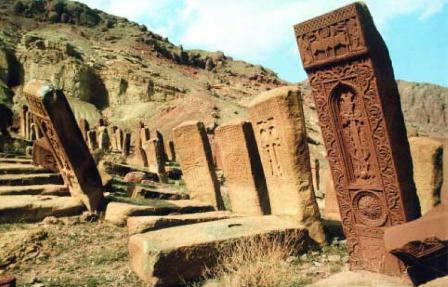 The specific abuses mentioned above have taken place in Nakhichevan (Naxchivan), the Azerbaijani exclave where every single indigenous Armenian monument has been reduced to dust by the state authorities. Azerbaijanis have started to refer to Nakhichevan as “Azerbaijan’s North Korea” with a reference to absence of recognition and protection of any rights in the region, reports Radio Free Europe.